We provide tailored solutions for your research needs and are happy to act in an advisory capacity either on an occasional, regular or even continuous basis. We can carry out the research for you if that is what you prefer. Providing tailored solutions for your health research needs includes helping you choose the right methodology to collect reliable and valid data. Tell us what you need to measure and we can advise you or carry out the work for you. This ensures you get the information you need within the compressed timelines often demanded by the client. We use focus groups with patients, carers and front-line staff to capture perceptions, opinions, beliefs and attitudes towards service delivery etc. We also explore patient experiences of their condition and treatment as well as clinical outcome assessment (COA) evaluation. See our case studies. Normally, we recruit between 8-10 people. Groups are guided by a moderator using a topic guide other qualitative techniques to solicit participants’ responses. We have carried out in-depth interviews with patients, carers, clinical, administrative, managers and frontline staff across a range of projects. These have included, factors contributing to ineffective health outcomes, patient experience and COA concept elicitation. See our case studies. In addition we also use projective techniques and the laddering technique to find subconscious motives behind responses. Utilising a mixed methods approach allows us to identify insights from the analysis of different data sets in parallel. These include, in-depth interviews, focus groups, diaries and cognitive debriefing alongside quantitative data such as surveys.  Using a proven ten-stage framework, we carry out a holistic analysis that provides you with a rounded view of what all the research evidence is saying. Exit interviews can provide a rich source of information about the individual’s experience and evaluation of the medication, treatment, side-effects, functioning etc. The data collected is normally qualitative carried out at various time points and at the end of the trial. When we have combination of data type we apply our ten-stage framework described above to carry out the analysis. Sample size is usually around 30 patients to increase the likelihood of identifying themes. Carrying out cognitive interviews is now an established approach in questionnaire design, clinical outcome assessment (COA) development. However, selecting the most appropriate method requires an understanding of the benefits, costs and the context as to which model will be most useful. See our blog post. We select the most appropriate method based on an assessment of the investigation’s requirements and the attributes of each model and analytical approach. This ensures you get the most informative information. Our workshops are a creative form of collaborative creativity.’ It’s a rich mix drawing on a combination of knowledge, and group decision-making. It’s the process of involving the client/customer/patient in the creation of meaning and value. We have applied this technique to COA development because it brings patients and key stakeholders together and who are tasked to collaboratively generate ideas and concepts. If you already have had your market forecasting survey questionnaire developed and just want us to undertake an evaluation and identify, remove and rectify any poor question wording and other sources of survey bias we will apply QuestReview™ our evidenced-based questionnaire evaluation tool. We will carry out a comprehensive review of the questionnaire and provide you with detailed feedback and recommendations on how your questionnaire can be improved. If you are starting from scratch and want to work with us to develop a market forecasting survey questionnaire that will provide effective and realistic forecasts, we will apply QuestDevelop™ our evidence-based questionnaire design platform. Designing a new questionnaire, or modifying an existing one, should really be left to the expert. It takes time and a focused effort. It’s very easy to design a bad questionnaire, but very difficult to design a good questionnaire. Tell us what you need to measure and we will provide tailored solutions for your health research needs. Ask most decision makers what they are looking for in insight reporting and they will tell you it’s a story. Reporting of research is normally presented in a building block structure. For example, literature review, summary of the qualitative research followed by the quantitative data. And then a leap to the conclusions. Storytelling has the power to capture an audience’s attention and engage them more deeply than standard presentations. Through story telling evidence is presented in the way decision-makers think. 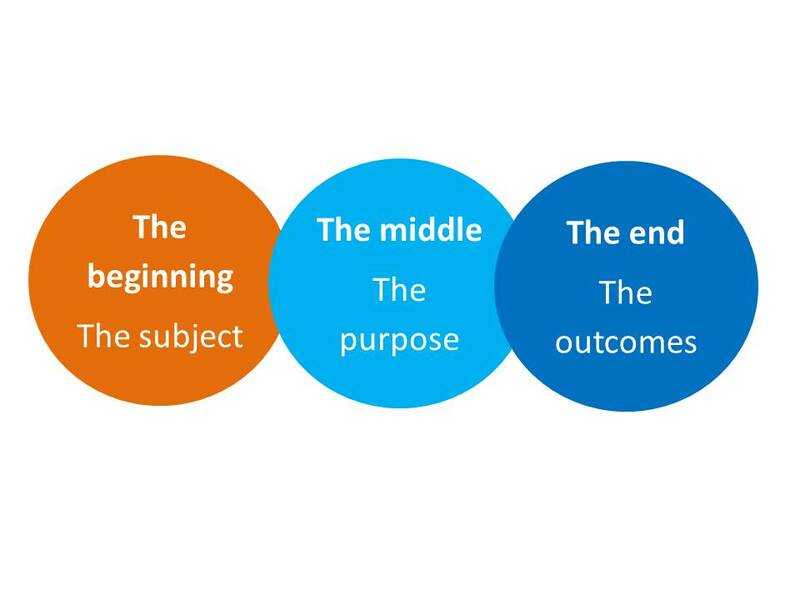 At Health Outcomes Insights we combine a five-stage data analytical framework with the three-components of good story telling. This helps you to find and deliver the story and make effective decisions. Visual storytelling can really help communicate complex information in an accessible and engaging way. Working with our designers we can advise you on how to tell the story. We are available to review marketing collateral and other communications to assess the strategic as well as accidental use of BE tactics that are influencing people’s (conscious as well as unconscious) thoughts and behaviours. This provides a great opportunity for a company to assess where they are in leveraging BE tactics, and explore more strategic use of BE. 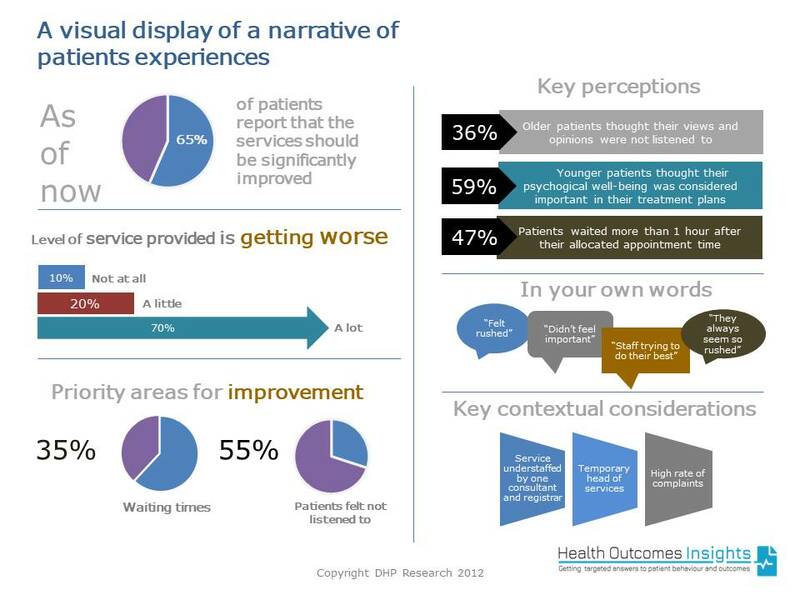 Experience sampling (ES) – a research methodology that asks participants to stop at certain times and make notes of their experience in real time – is increasingly becoming an approach to overcome the potential biases in patient retrospective reporting of symptoms, behaviours and experiences.